Oh my.....cute!! I could sit and watch pigs, chickens and turkeys all day...I'm so easily amused! The name Bacon Bits came from Pioneer Preppy. :) We sold two last night and so have two more to go. In some ways I wish we could just raise a few every other year or so, but pigs are expensive to buy, plus we'd have to get full size hogs because no one around here has the American Guinea Hogs. We've learned a lot from this experience and will have to think out the best set-up for next time. Bacon Bit, Ha Ha, my menfolk thought this was very funny and then they wanted to know where you are. We looked up the mountain range and i cant pinpoint where exactly but Rob is hoping you are in Kentucky - he's a Bourbon man. What a delightful, happy life the Bacon Bits have had. Will be interested in hearing what you've learned about this first piglet-go-round. Be sure to let us know how much pork you ended up with in your freezer from the two you plan to butcher. I didn't know they could be weaned as early as five weeks. When we got our piglets at eight weeks old we figured out that they could get through the field fence on our pasture. We'll have to wait and see how it goes when we have piglets. I'm glad you went first so we can learn from your experiences. We look forward to butchering the two barrows we bought with our breeding pair. I've read a lot about the quality of the meat and lard and hope they live up to our expectations. ut oh! Visiting the neighbor's dogs is not good! I would never have believed they could crawl under that gate! Fence crawling though is a very learned habit. One crawler and everyone learns to do it! Will you try a low electric wire next time? The local old timers tell me that pigs are super easy to contain with a little hotwire. They claim once hit a pig won't go near it again. Of course running hotwire that low might be fun and I have had em tell me things like that before and found out it wasn't quite true in practice. I really want to keep a pig or two around here but haven't worked up to it yet. Piglets are always so cute. When I was a kid we used to pick em up in amazement that such small things could be so loud. 5 weeks sounds young for weaning - is it because of the breed? So cute! I want a couple of guinea hogs sooooo bad. BTW ~ I got the second post done last night. I thought it was clever too, but the credit goes to PioneerPreppy for first mentioning it in a comment. Our location is undisclosed, because I've had folks want to just show up for a visit. I know you'll understand that I'm not quite comfortable with that, especially since Dan's job has him away from home at times. I will definitely do that. It's been a great experience and hopefully we'll be able to improve on it next time. Meat harvest will be in October and November, so I'll have that news to report then. Fern, I got the weaning age from the American Guinea Hog Association website. They say five to eight weeks. I've also read (can't remember where) that if they continue to nurse much beyond that the sow will lose weight. I got the impression it was from increased milk demand, but also, the piglets will take over mom's food dish so that she get's less. We gave them their own but they want mom's! Mushu and Kahlua! LOL. Two down and two to go. Barb, we haven't been able to find a good processor around here. There is one in the next county, but their waiting list is so long that they don't even answer the phone. They took us when we had a goat with a broken shoulder because they didn't want to see her suffer, but I've never been able to get an appointment since then, so we've had to learn to do it all ourselves. They weren't that expensive though. I think it was a $35 kill fee and then the rest was so much per pound processed. Actually I found both of our pigs on Craigslist! They don't come up real often, so I'm hoping there's a good market for them. Most folks who see them are really interested in them. The breed is very appealing. Oh yes, they are crawlers! We aren't planning to add a hotwire though, we're just plugging the holes. :) Primarily this is because we move the pigs from pasture to woods to pasture as needed, so it would be a lot of wiring to do all 7 areas. Once they get a little bigger that isn't a problem anyway. Well, we have electric netting that we use to divide areas, and I can tell you that is long as it's juiced, the pigs respect it. If for any reason the current is off, they know! I don't know if they can feel it or smell it, but they go check every time it's up to see if they can breach the barricade. I'm not sure about other breeds, but according to the AGH website (see link in above comment) 5 - 8 weeks is a standard time to wean. I really didn't expect to sell any as soon as I put up the ad, but even so, I wouldn't have let them go sooner than 5 weeks. The other 4 are still nursing, however, and I hope the last two are sold soon! That's hilarious! Such good tales from our critters. How can anyone want any other life? I love that breed. I had two Guinea Hogs when I first started homesteading. They were great. I did find that they had a high degree of lard when processed. Piglets are the cutest things EVER! And you are right - they can move! I'm enjoying your pork venture virtually - hoping that some day I can raise them again. That is good information, Leigh, thank you. I can see where they would want mom's breakfast and theirs as well. How will you wean the ones you're keeping? Luckily, once they get to be huge, the cuteness factor is long gone - and the bacon factor is way up! Susan, I'm glad to hear about the lard. I'm counting on that, although we will likely process fairly young. They are a great breed to have around the place. I honestly didn't know how I would like pigs, but they were an exciting addition to the homestead. I really like this breed, however, which has made for a really good pig experience. I think that helps. WhAt do you feed the pigs for the most part? Goodness you've been busy :-) Sorry I have been AWOL for a while, look forward to watching piglet progress. For the most part they feed themselves. This is a grazing and foraging pig, so they are well suited to pasturing. I give them garden and table scraps plus whey, but mostly they feed themselves.. I love that you called them "the Bacon Bits" !!! Our pigs (when I was a child) were always named food names to remind us they weren't pets. We ate, Pork Chop, Bacon, Ham, and Eggs, and (my favorite) the one that ended up being called Sausage Pig Monster (he was an escape artist as well). Oh, they are so cute! And pretty, I love that they are black! I sure do like those pigs.... I hope they find good homes. How much does a pig like those cost? I find myself calling them the pork chops too, LOL. They are quite the escape artists! We're still blocking places they seem to find with ease. It's a handsome breed! Of course, the love to decorate themselves with mud, but mud is beautiful too. Hum. Well I would like to have some pigs, but I am pretty sure I couldn't keep them warm in winter. What I was thinking is, if they cost $100.00, is it cost effective to make them into bacon and such? Seems like you could buy more meat than they would bring you with that much money. But I know you are striving for complete self sufficiency so that may not be an issue. It gets 10 below up here in winters sometimes. Could they be ok in a straw house out of the wind. I mean a house built of bales of straw, like I make for the dogs each year. I admit they're priced more for folks who want to raise the breed rather than to raise for meat. Around here, at least, the lower priced pig is $50 to $75, so that would be a better price for buying a meat hog. If the last two don't sell soon I will probably lower their price. Waldo and Polly spent last winter in a straw house and did very well. Our lowest temps are only down in the 20s though. I kind of doubt hog raisers farther north heat their barns, but I really don't know. That's awesome! Do you plant things for them to graze on? I was thinking to buy them so they wouldn't get eaten. I asked one old man who raises hogs, and he said they would be ok in a straw house, but that they would go off into the forest to root for acorns come spring and maybe they would come back and maybe they wouldn't. The chickens have already destroyed all my wifes flowers and plants, and what was left the goats devastated, so that at least is not a problem. 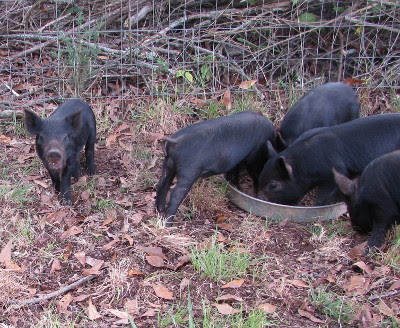 So, you think the people who buy the little black pigs won't be buying them to slaughter? If you still have some when it comes to "that time" or gets close email me and let's see if we can work something out. Even if they went off to root in the forest if I fed them good mash they should come back. Well, I don't really know. I've priced them a bit too high for just eating, at least I think I have considering other pigs are on offer for $50 - 60. I have two left, so I'll have to let you know! Ok. My Philip Nolan email address is at the top of my blog.